Every physician confronts potential bacterial infections everyday during his or her professional life. Whether to avoid them in the operating room or to treat a patient’s disease, bacteria and their antidotes – antibiotics – should always be treated with the utmost care. To treat microorganisms in the right way, each doctor of medicine must have knowledge and understanding of the basics of these life forms, their virulence factors, and their vulnerability. The intrusion of bacteria into a host, either passive or active, is referred to as an infection (Lat. inficere “to put in“), if their proliferation and the reaction of the host lead to a disease. Bacteria, which cause a disease in the human body, are referred to as human pathogenic. In a size range of 0.2—2 µm there are three basic forms that hark back to the morphology of all eubacteria. Cocci: spherical or oval. They often appear in groups of two, four or eight cells (Diplococci, Tetrads, Sarcina), in grape-like clusters (Staphylococci) or chains (Streptococci). Bacillus: rod-shaped, in different manifestations: slim (e.g., Mycobacterium tuberculosis), plump (e.g., Escherichia coli), pointed or rounded ends etc. Helical-shaped: have distinctive morphological distinctive windings; including Spirilla, Borrelia, Treponema and Leptospira. Regarding their structure, prokaryotes differ enormously from our eukaryotic cells. Although the different types of bacteria vary in their metabolism, structure, and virulence, they also possess some common structures. The most important organelles and their functions are listed in the table below. The cell membrane will be discussed in the following paragraph, as it plays an important role in the classification and treatment of bacteria. The most important task of the solid cell membrane is to withstand the high osmotic internal pressure of the bacterium and, furthermore, to prevent the cell from bursting. The cell membrane of all bacteria consists of peptidoglycans or murein. This grid consists of the polysaccharides N-Acetylmuramic acid and N-Acetylglucosamine both of which are interconnected through short peptide side chains. In order to understand the difference between the two subspecies—gram-positive and gram-negative—better, the gram-stain will be explained first. 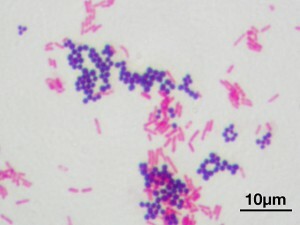 During the gram-stain process, bacteria are colored using crystal violet and Lugol’s solution. Afterward, the cells need to be washed intensively with alcohol and are counterstained with eosin (red stain). A thick murein layer prevents the washout of the stains—in that case, the staining is positive and the bacteria appear blue under the microscope. In presence of a thin murein layer, the staining is washed out of the cell—this means that they are gram–negative and, due to the red counterstaining, the bacteria appear red under the microscope. Gram-positive bacteria possess a thick cell membrane that consists of multiple layers of peptidoglycans and a thick murein layer. Anchored in the cell membrane can be various proteins, cell membrane-teichoic acid and a specific polysaccharide. Gram-negative bacteria possess a single murein layer on the outside of which another second outer membrane is located. This membrane contains, for example, lipopolysaccharides that have an endotoxic effect when the cell breaks down. The crucial factors to develop a cell membrane are transpeptidases that connect individual components with each other. Transpeptidases are an important target for penicillin and other antibiotics. This article only relates to human pathogenic bacteria. Human pathogenic bacteria are always chemosynthetic (convert carbon into organic matter) and organotrophic (they obtain their energy from organic substances). The primary means of producing energy is the oxidation of organic substances and the transfer of electrons such as H+-ions. This procedure is the same in prokaryotes and eukaryotes. Therefore, bacteria use two different metabolic pathways. Respiration is characterized by the transmission of H+-ions to oxygen. There are both aerobic respiration and anaerobic respiration, where oxygen is chemically bound in a type of salt. The energy yield of respiration is about ten times greater than the yield of fermentation. In the absence of oxygen, another organic compound serves as hydrogen acceptor. The end products of this process is alcohol, carbon dioxide, and lactic acid. Facultative anaerobes: bacteria can perform aerobic and anaerobic respiration. Obligate aerobes: bacteria are reliant upon aerobic respiration and thus require oxygen in their environment. Obligate anaerobes: bacteria are perfectly adjusted to anaerobic respiration. Their metabolism gets inhibited when brought into contact with oxygen. This results in cellular death. Aerotolerant anaerobes: bacteria are perfectly adjusted to anaerobic respiration and tolerate low levels of oxygen because they have superoxide dismutase. Bacteria multiply by simple cell division. The two daughter cells that result from the original cell have two identical (apart from incidental mutations) copies of the genomes. This vertical gene transfer from one generation to the next one appears clonally. Therefore, a recombination of genomes as in the meiotic reproduction is not possible. Bacteria achieve genetic diversity through horizontal gene transfer, which means the exchange of information between two individuals of the same generation. The exchange without meiosis is also referred to as parasexuality. Transformation is the absorption of naked DNA fragments from a lysed bacteria. This occurs without the need for vectors, bridges or other, chemical tools. Some bacterial species possess this natural competence for DNA absorption. Using receptors, they acknowledge DNA-strands on their cell surface, which results in fragmenting them into short, single-stranded pieces and phagocytose them into the cell interior. If there is a homologous gene segment, the external DNA can mate and take the new information into the genome. This type of gene transfer takes place only within one species as the bacteria recognize species-specific DNA. Transduction occurs when a virus enters a cell and has bacterial genetic material (bacteriophage) in its capsid. This new piece of genetic material takes over the cell and the bacteria will begin to produce the bacteriophage, viral capsid and enzymes. Eventually, the cell will be filled with viral components and bacteriophages and will lyse. The virus will then proceed to infect another bacterium. 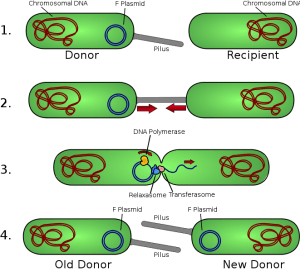 Via so-called conjugation bridges, individual plasmids between two cells are exchanged. The F-plasmid contains the genes which allow the formation of a conjugation bridge and the passing of a plasmid. The bacterium that contains the F-plasmid represents the donor cell and its partner, the recipient. The donor cell forms F-Pili (pilus Latin hair), which establishes contact with the recipients. Afterward, the pili shorten and fuse, so that a pore or a short bridge is present between two bacterial cells. 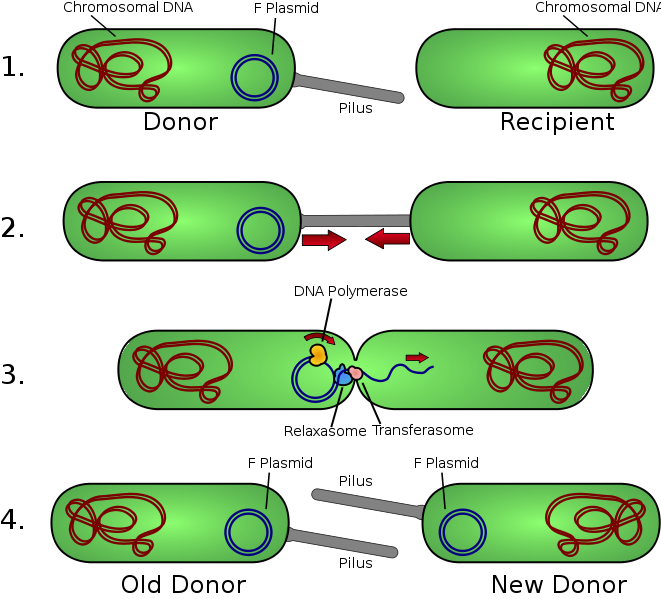 Due to the rolling-cycle-mechanism, a single strand of the plasmid can be synthesized, which is then later completed in the recipient to a double F-plasmid form. The recipient now can also pass as a donor the F-plasmid. This gene transfer is only unidirectional (in one direction). Donor and recipient are sometimes abbreviated with F+ and F– in literature. The proliferation of a bacterial population follows a typical growth curve. It can be observed by exposing a particular number of bacteria in a nutrient agar. 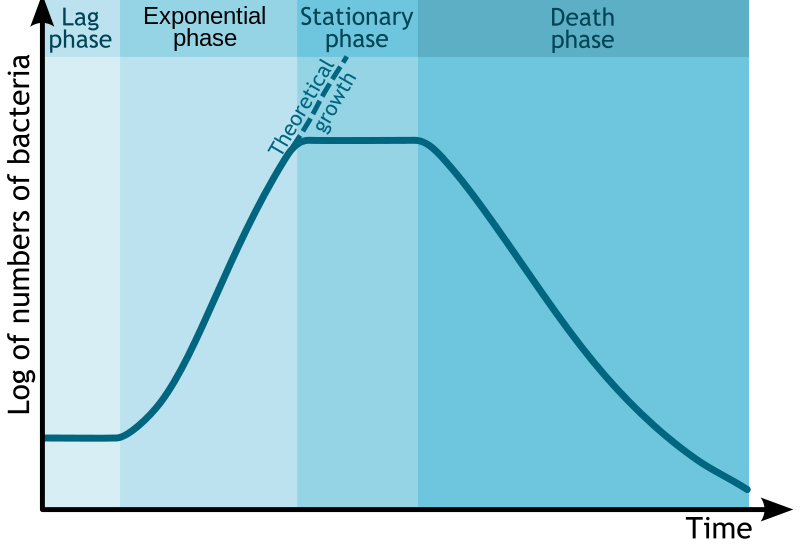 After an initial slow cellular growth and adaptation to a new environment (lag phase), population starts to rapidly divide which quickly results in an exponential growth through numerous cell division (log phase). 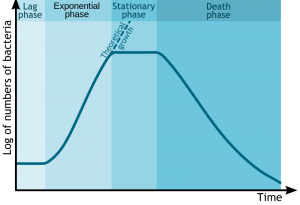 During the deceleration phase, the cell growth slows down and culminates in a stationary phase. The bacteria count increases to up to 10^9 cells/ml. Due to nutrient exhaustion and increasing of toxic degradation due to cellular overcrowding, the death phase will be initialized. The exponential growth of bacteria shows that the treatment of a bacterial infection should be initiated quickly and that waiting can cause a proliferation of pathogens which can induce fatal consequences. However, the growth rate depends on the supply of nutrients and other environmental conditions. In order to estimate the growth rate of certain bacterial strains, the generation time T, which stands for the duration of a division of the parent cell into two daughter cells or a doubling of the bacterial population, is determined. T/t indicates the number of generation times or divisions. The equation is logarithmized, since, in this form, it corresponds to a linear equation. The graph of the logarithmized cell number against the time t corresponds to a straight line with a slope 0.301/T. The generation time can now be read from the graph. The virulence of different species can differ widely. It is specified by using the LD50 (lethal dose 50), that represents the dose at which 50 % of an infected test group dies. In bacteria with a strong virulence, there are only minor differences between the LD50 and that dose at which 100 % of the individuals in a test group die. An example of this phenomenon is Streptococcus pneumoniae. The LD50 cannot be determined as only a few cells of this bacterium are able to kill an entire test group. In contrast, the LD50 of Salmonella enterica is a clear demarcation of the LD100. To kill the entire test population, a pathogen dose about 100 times more is required than for killing 50 % of the test objects. 1. Which organelle is missing in bacteria cells? …a special dyeable surface protein, which is only contained in gram-positive bacteria. 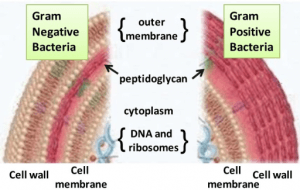 …the additional membrane of gram-positive bacteria. …the thinner second membrane of gram-negative bacteria. …transporters that carry the stain in the cytosol of gram-positive cells. …the different sugar structures in the murein layer of positive and negative cells. The incline of the straight lg n = lg n0 + t/T x lg 2 directly mirrors the generation time. LD50 designates 50 % of the concentration which would kill 100 % of the test animals. Horizontal gene transfer induced by conjugation is only unidirectional. 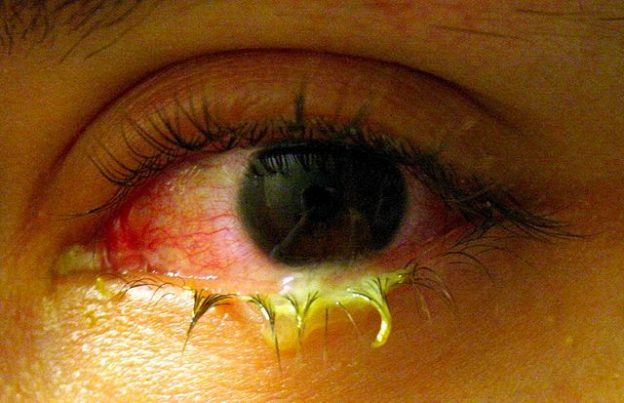 Virulence is the ability of a bacterium to cause a disease. Obligate anaerobes are able to survive both in the presence and in the absence of oxygen. Groisman, E. A. (2001). Principles of bacterial pathogenesis. San Diego, CA: Academic Press. Nataro, J. P., Blaser, M. J., & Cunningham-Rundles, S. (2000). 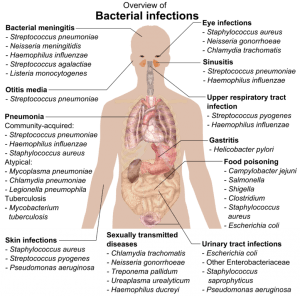 Persistent bacterial infections. Washington: ASM Press. World Health Organization. (2001). WHO model prescribing information: Drugs used in bacterial infections. Geneva: Author. It was so helpful and took my mind back to square one! !